Meet B037, or 1446262 as I affectionately know him (1446262 is his BTO ring number)! B037 was first ringed and GPS tracked in 2010. Although we tracked some immature gannets last year, prior to that all tracking had been of breeding adults as they are far easier to re-catch and remove data loggers from. 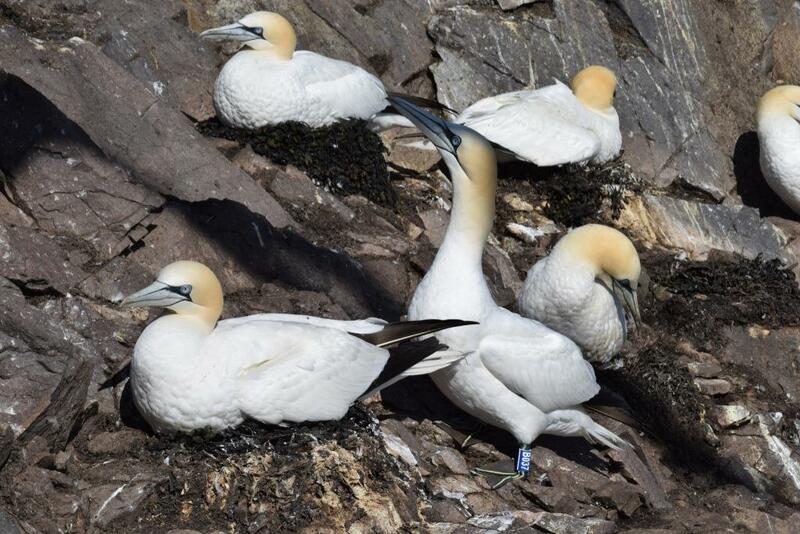 As gannets don’t breed until they are at least 5 years of age we know that B037 was at least 5 years old in 2010. Last year he was breeding again so we GPS tracked him for a second time. We also gathered flight height data from him. As you can see from the photo above, he’s back at the colony again this year although sadly it looks as though his breeding attempt has failed. Tracking the same bird in multiple years is really exciting. The data gathered from the trips can tell us how repeatable individuals are in their foraging behaviour and allows us to compare their behaviour with others in the colony. We can also look at how behaviour can be affected by weather conditions and other environmental variables in different years. Here you can see the tracks of B037’s foraging trips in 2010 (pink) and 2015 (blue). We recorded 3 trips from him in 2010 and 8 in 2015. His trip durations were slightly longer in 2010 (25 hours average) than in 2015 (23 hours average). Corresponding with that, he covered a greater distance on each trip in 2010 (538 km average) than in 2015 (470 km average). So this part of the data I am gathering and analysing again this year (I’ll blog more on flight height later in the summer). Hopefully I’ll be able to tag some of the birds I tracked last year so that I can see how consistent they are in how high they fly as well as seeing if they are going to the same places.